Another week, and a bit more progress. It is called Slow Stitching for a reason isn’t it! I have three of the four balls of yarn done and bit of the greenery on this one. 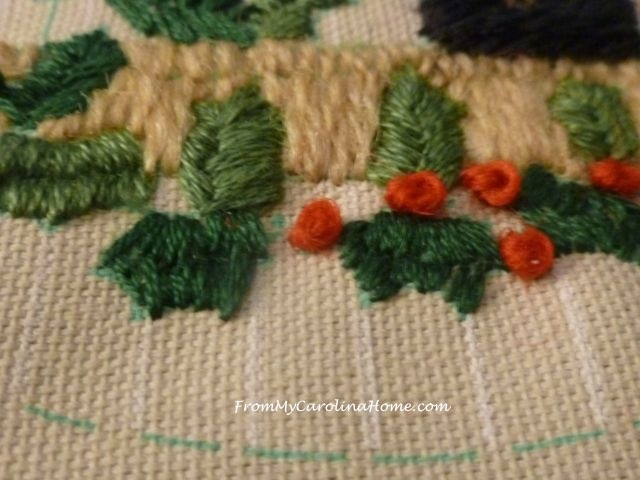 I thought the tomato was done, but realized that I needed some French Knots to complete the berries. While working on the French Knots, I was reminded of several friends who used to claim that they couldn’t make those work. So, if you are among those, here is the trick to make them perfect every time. Start by pushing the needle up through the backside of the fabric where you want the knot to be. Then wrap the thread around the needle two more times, so you get three tight winds around the needle. Place the needle back into the fabric just one thread over from where you started. 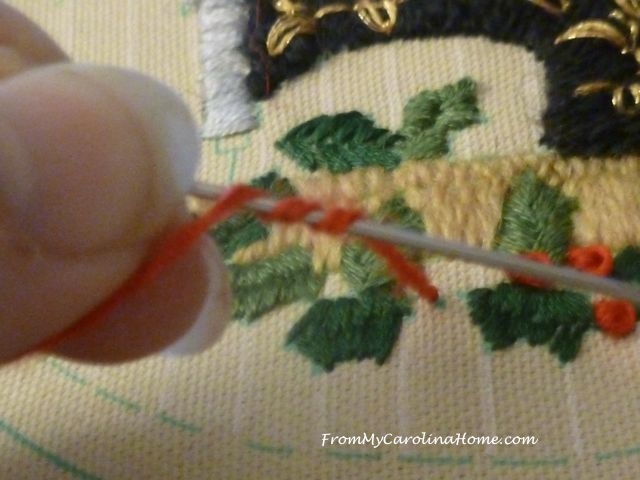 Pull on the thread end until the loops slide to the end of the needle in a tight knot. Then, continue to push the needle on through the fabric, pulling the yarn through to set the knot. I did get a bit farther on this one, after the knots were done. As much as I am enjoying the slow stitching this year, I am certain that I will not do this same set a second time. I just have too many other things to do, including all these other kits! Beading kits, a Christmas bell pull, and a cross-stitch Thanksgiving cornucopia I may never get done because I have messed up the fruit part somewhere and I need to get the instructions enlarged so I can see them again. 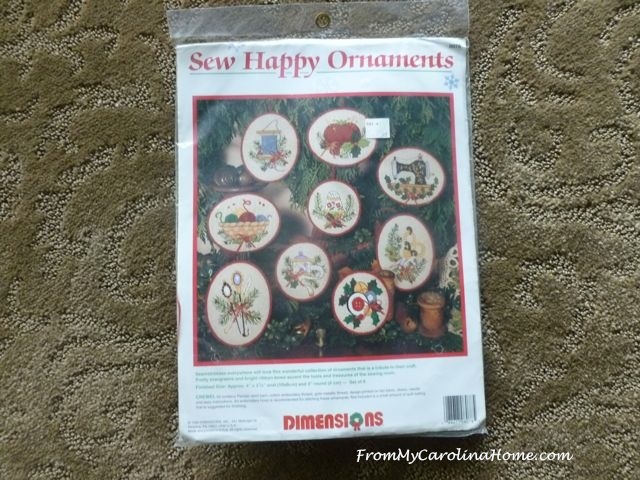 So, I am going to give away the other unopened, complete kit of Sewing Ornaments I have. Just leave a comment on this post if you would like to enter to win! Just tell me what kind of slow stitching you like best, and if you have ever done crewel work. I’ll pick a winner next Sunday. Good luck and happy stitching! I have never done crewel before but have lots of experience with embroidery. I have enjoyed seeing your ornaments each week. I have done crewel work years ago and really enjoyed it. My favorite right now is embroidered wall hangings. Your ornaments are turning out very cute. You are making great progress! It’s a great idea to have a day dedicated each week to the handwork. 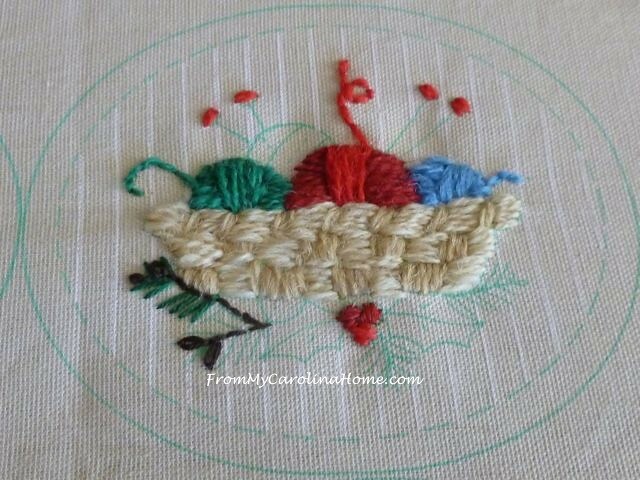 This would be the perfect opportunity for me to try crewel work. Thanks for the giveaway! I have not done crewel work before, embroidery-yes, needlepoint-yes, cross-stitch-yes. 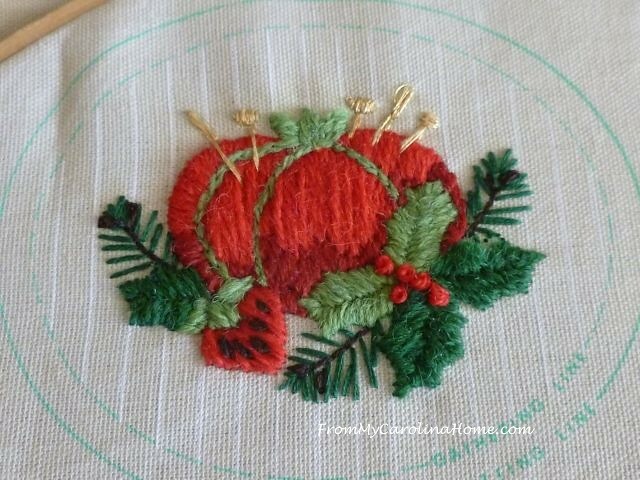 I’ve done lots of redwork (or other various colors)–would love to try crewel (have lots of crewel yarns)–pick me please! Love your work. I can’t think of any hand stitching that I do not enjoy. Unfortunately, crewel work with wool doesn’t like me. Allergic to all the microscopic pieces of wool that float through the air as the needle passes through the canvas. So, no large crewel projects any more. 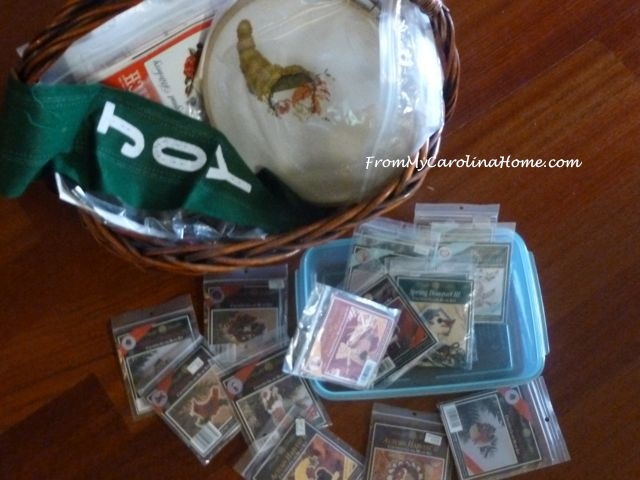 I would like to win the kit….small projects are fine for me. Thanks for your post today. …enjoyed. Wow! Those are wonderful projects you are working on. I’ve done a little bit of crewel work…I have a project of my sister’s I need to finish for her! I mostly do embroidery. You do such lovely work! Your ornaments are coming along nicely. I would love to enter a contest but I have so many of these already! Good luck to a winner!!!! Like your ornaments. I’ve done cross stitch but following the stitch lines bothered my eyes. I did crewel work and embroidery many, many years ago and recently picked it up again. I find it relaxing to sew and work on projects. Thanks for the giveaway. I enjoy all your posts. Good Morning Carole! We have a tad bit of fog this morning for the first time this year, plus we had a full day of rain so Fall has finally made its full announcement here in Southern Oregon. Which, for me, means lots of extra time indoors doing hand embroidery, quilting and maybe even some garment sewing. I have really gotten back into (as you call it) Slow Stitching over the years and so enjoy it. I really enjoy Crewel Embroidery, although I seldom actually use wool; my go to choice of threads is DMC. I am doing several projects right now, the three most important are hand embroidered appliqued heart shapes for my Double Wedding Ring Center (although, I am just not sure I am liking the way they are holding the edges…I am really afraid the edges are going to fray terribly, even though I used a fusible interfacing). The second is a wall hanging of an owl that most likely will be a Christmas present for someone, with it I am now on the outside top border and just doing a random backstitch following a pattern on the material to quilt just the batting to the material. The third is ongoing, I am hand embroidering Christmas Scenes and such onto material then quilting it to batting, then hand embroidering it to card stock and creating Christmas cards. They are really a lot of fun. 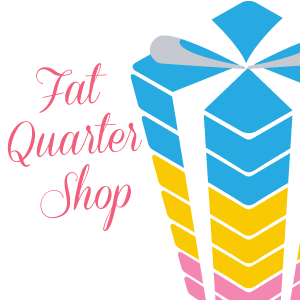 Today, I am going to quilt a 55 by 55 quilt for a lady for the Project Linus Guild. 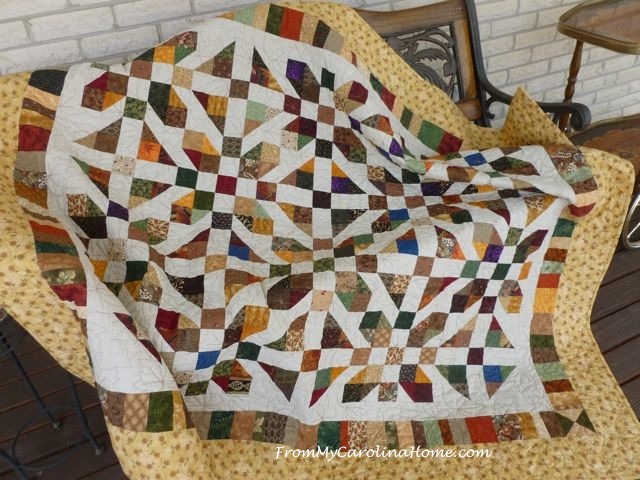 Then I am going to be cutting out some more two and a half inch squares for the border of the Scrap Dance. I have decided to add a total of 4 rows of scrap squares and then decide from there. Strangely, I actually used up quite a few of my precuts in making blocks A and B. Thank you for sharing and this great give away! Have a wonderful creative Day! Such cute little motifs! Yes, I’ve done all sorts of needlework – my MIL gave me a crewel kit for a clock many years ago, & tho she didn’t live to see the finished project, she did enjoy watching me work on it! It is special also because the wooden frame, (box with glass window on the door) the clock came with was finished by her son (my husband!). As far as those fruits on your Thanksgiving project, can’t you make them work? Fruits come in all colors, after all! Good luck! I did some crewel embroidery many years ago along with needlepoint. Now I am more apt to do just simple embroidery. 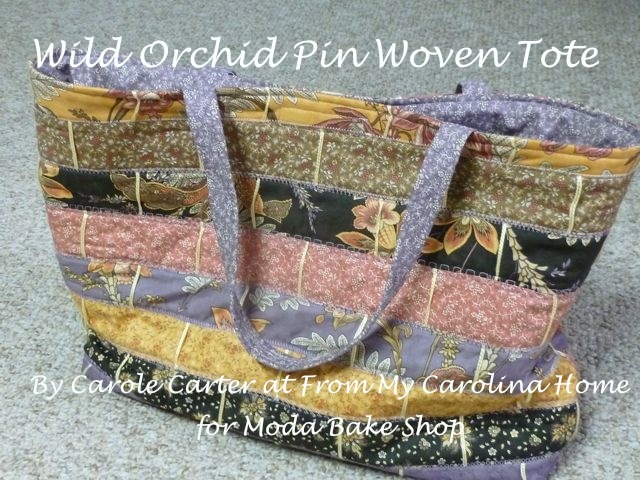 I love crewel, as well as other types of needlework, but crewel has a special place in my heart as when my father-in-law was dying of cancer, he loved to watch me do crewel and had such an interest in Southwestern crewel pictures, I was making, Love your ornaments and would love to win. I met you at the Moda demo at the quilt show. Look forward to your blog and the progress on the ornaments. They are so beautiful. Love the sewing machine. Got my fingers crossed. Thanks for the opportunity to win. Would love to win this adorable kit; thanks, Carole, for the drawing. My favorite slow stitching is currently needle turn applique. It’s been years since I’ve done crewel work. 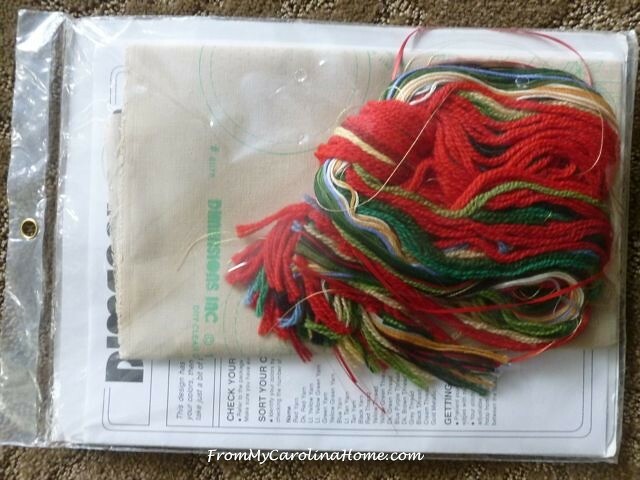 And I still have a wonderful collection of wool threads which I use on wool applique. :o) BTW, I am a new subscriber to your blog and enjoy it very much. I’ve only tried cross stitch and ribbon embroidery. I had an eagle to embroider once but there was rust on my fabric and i soaked it. It got the rust out but it also took the pattern off the fabric. Lol. 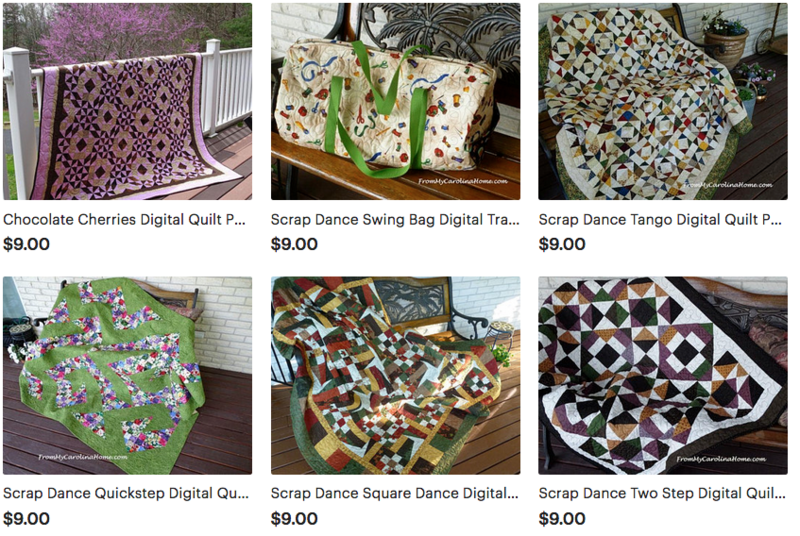 I enjoy the verity of your sewing posts. You have made great progress and thanks for the tutorial. Alas, I’m opting out of the draw as I have way too many UFO’s and projects in bags waiting for me to work on them as it is. You are making progress and I so enjoy seeing your work as it is beautiful. Crewel is my favorite! I love all the different stitches involved. Thank you for the wonderful giveaway. 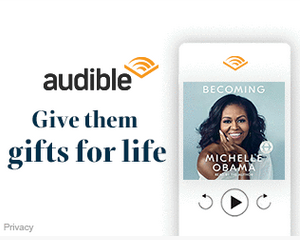 Oh my goodness, I would love to be entered in your giveaway. I think my favorite slow stitching is counted cross-stitch, but I had done crewel-work, stamped cross-stitch, quilting and more. I am not afraid of any needlework. 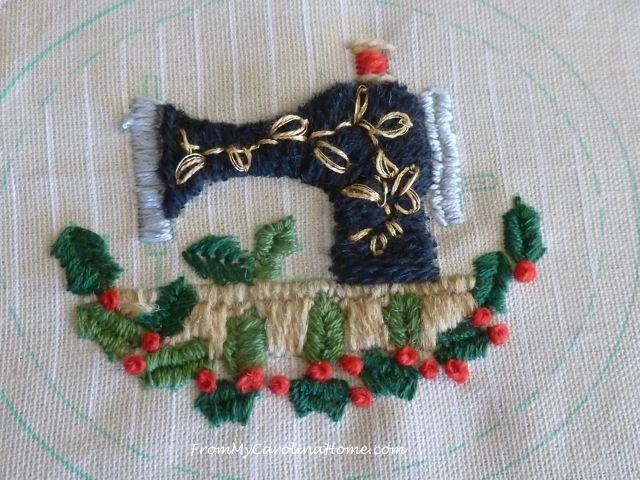 Okay, maybe applique, but I am determined to try that someday also. It looks like you have some other great WIPs also. I like seeing what you are working on. Yes, I have done crewel and many other types of handwork. 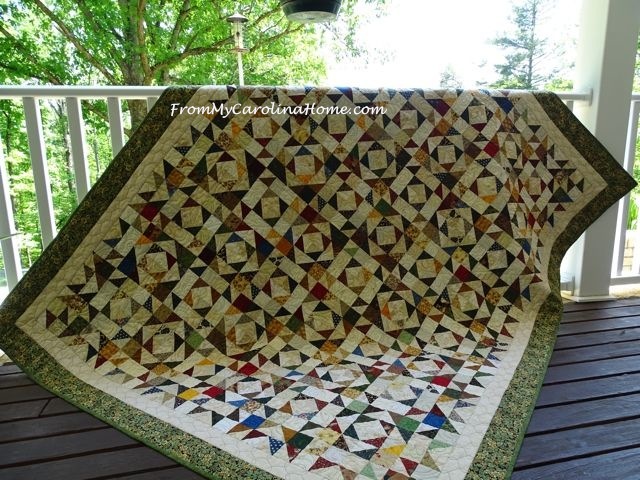 Your project re-piqued my interested in crewel because I have been side-tracked by quilting for about 5 years. 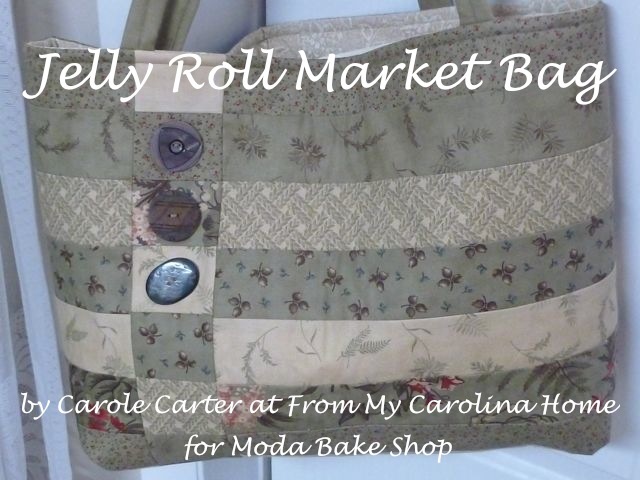 This would be a great project to try crewel again. Thank you for the chance to win the ornament kit. I’m mostly a counted cross-stitcher, but I have done crewel work, too. I have a embroidered Advent calendar I pull out every year. Love it! Depending on how big these are, I bet they’d look great on the Advent calendar! I have enjoyed all slow stitching that I have tried — so relaxing. Yes, I have done crewel, but it has been several years. These are lovely ornaments. Your embroidery is coming along wonderfully. I rather like slow stitching. There is something about stitching a piece in an unhurried fashion. Your french knots look great. 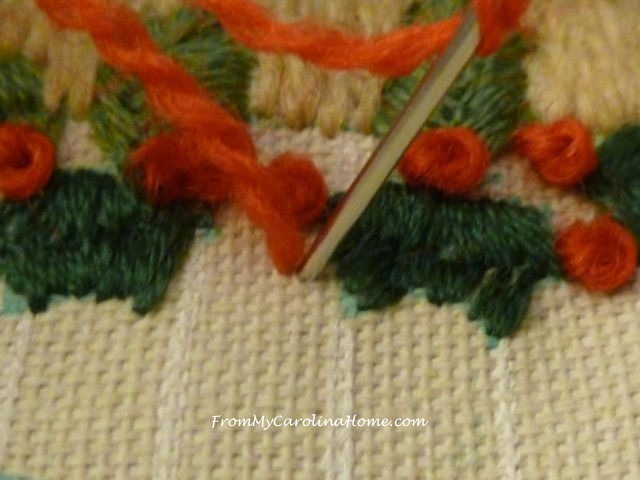 French knots can sometimes be a bit tricky but once you master them they seem to multiply rather quickly. Those are really cute! I love all kinds of hand stitching. My current slow sititching projects is a counted cross stitch. I have done plastic canvas, cross-stitch, crewel, embroidery, EPP and other hand sewing. I have liked them all. If I had to name a favorite, I would probably say it is a toss up between cross-stitching and hand sewing. Pretty ornaments! I haven’t yet done crewel work, just regular embroidery which I love! Thanks for the opportunity! Would love to win it! I’ve been looking for them since you first showed them…. I’ve done a chair seat cover, that I need to remove and gently wash now, it’s so old and dusty! and I have some crewel needlepoint chair covers that I bought at a thrift store that I need to sit and work on, you’ve inspired me! I got to thinking that I need to be doing something in the eve’s while I watch TV to avoid the munchies…. and hexie work was getting a bit boring! 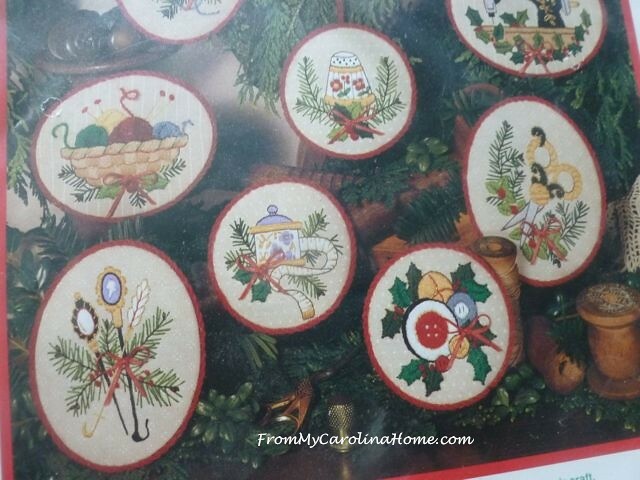 What lovely ornaments; I’d love to win these. In recent years my slow stitching has been cross-stitch, either counted or on printed canvas. In earlier times I did a fair amount of needlepoint, finishing several pillows and a wall hanging. I haven’t done much crewel but like working with the wool yarns. ( I have also done knit and crochet from time to time). I do a lot of quilting so some of my slow stitching is on bindings, either my own quilts, or on the quilts our guild makes. I like making small embroidery wall hangings and then add some quilting piece to it. thanks for the neat giveaway. I love the sewing machine you showed, just darling! Oh wow, those ornaments are so pretty! I’m not totally sure what “slow stiching” is…but I did have to make those french knots when I did some candlewicking. Thanks and God bless! Beautiful ornaments! 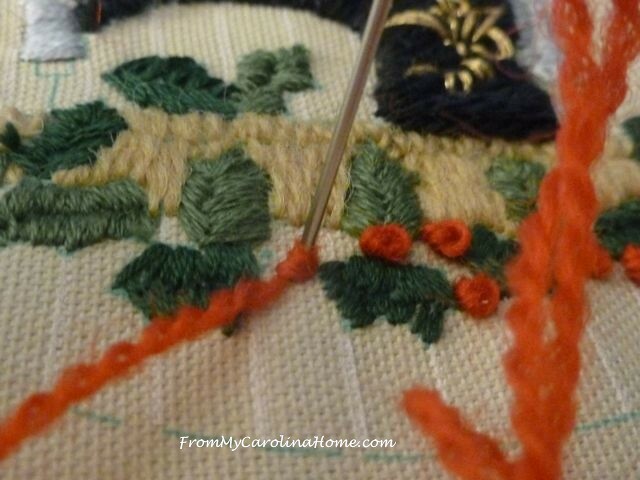 I’ve pretty much tried every kind of needlework, including crewel, over the years. My favourite probably is Cross stitching, but my eyes aren’t what they used to be, and all those Xs are getting tough to look at too long! LOL. I’ve been thinking about going back to embroidery and crewel.